From the time I was a girl I wanted to adopt. I watched the faces of the children of Vietnam in the 1970’s, Romanian and Russian orphans in the 1980’s,and Chinese and Indian girls in the 1990’s. These were the faces of the children who were not wanted and I wanted to “save” them. Little did I know that the journey to adoption would test my resolve, make me question my religion, and finally, teach me about true faith. In a sense, it was I who was saved by adoption. From early in our marriage we talked about adopting “one day”, but as everyone knows, one day flows into another. If you are not careful, the time for action is gone. In the early years of our marriage, money was very tight and then along came our two beautiful boys. Time passed so quickly. One afternoon in September 1999, almost 13 years into our marriage, we began discussing adoption again and decided it was now or never. I began doing research right away. 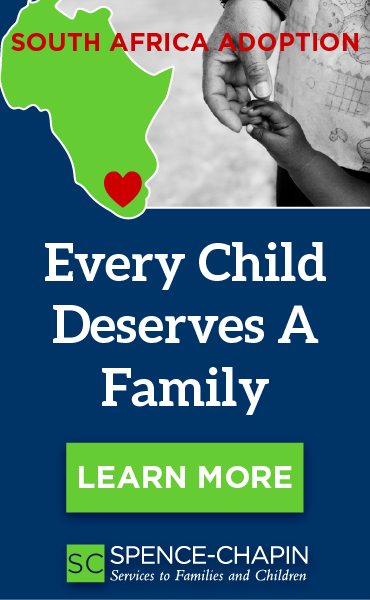 I wanted to know which agencies were respected, how much adoption would cost, and what sort of care the children received. We knew we wanted a little girl and we were both taken by the plight of girls in India and China. Children, unwanted because they were girls. We have many Indian friends and are familiar with the culture and customs of India. It seemed a natural decision for us. I found an agency that had a good reputation and began talking to them. Within days we had a photo of a beautiful little girl with sad eyes. Something in her sadness captured my our hearts. We began to pursue adoption of Sunita Marie. By March we were waiting for the call giving us travel dates. Sunita had a photo album of her family and new home. We had connected with a couple of families who had met her. We had many photos that we carried with us. She knew her mommy and daddy were coming. In April there was a phone message from our coordinator. I knew from the sound of her voice that something was wrong. At that point the most tragic thing I could think was that our trip was to be delayed. When I phoned her, she told me the devastating news. Sunita had a brain tumor. I got as much information as I could, including a fax of the doctor’s report, and started making phone calls. Everyone I had ever known that was in the medical field got a call in the week that followed. I could hear the answer in their voices, even as they tried to soften the blow. The type of tumor she had was 100% terminal. I contacted doctors all over the US and Canada, top neurosurgeons and oncologists. It took a lot to convince me that there was no cure. Our little girl was going to die. I was still determined to “bring her home,” to “save her.” I had visions of myself holding her and stroking her hair and bringing her comfort. Miracles happen everyday, I told myself. We love her. It did not matter that we had never held her in our arms, we held her in our hearts. In our hearts she was, and is, our little girl. It took much soul searching to realize that our wanting to bring her home was selfish. She had, by all accounts, about six months to live, maybe a year with extensive treatment. She was three years old, living with the only people she had ever known. To her, they were family. We were the outsiders. We knew that her long term future lay with us, but she did not have a long term. What we were offering her was a new family, new foods, new language, new customs, and lots of travel, doctors, and painful treatments. But we could not offer her what we most wanted to give her, a future. Eventually we came to believe that bringing her home would be cruel. It broke our hearts, but for her sake, we had to turn and walk away. It broke our hearts and we questioned ourselves anew everyday. Our agency begged us to reconsider. They even went so far as to ask us to bring her home and then disrupt the adoption so another family, one willing to adopt a dying child, could have her. They told us they had found a specialist, one who might save her. Each time we began to hope again our hearts were re-broken. Each time we would rise in hope and fall in despair. Weeks of uncertainty followed. One day a friend that I had met on an Indian adoption internet link wrote me about the beautiful children of Kazakhstan. I went to Rainbowkids.com and found hundreds of beautiful children, each more adorable than the last. There was one little girl with disheveled hair and a grin a mile wide whose photo I “visited”everyday for weeks. I kept hoping that she had found a home. Then one day I realized that I was holding my breath. I was hoping that she had not found a home. It was then that I realized I had fallen in love again. At first I was angry with myself. How could I love another little girl when MY little girl lay dying in India. It took me some time before I could forgive myself and begin to believe that God had led me here. Perhaps this was our child. I researched and then contacted World Partners Adoption and asked about her. We received her video a short while later and we were hooked. In her video she was playing with blocks and there was such an intensity to her. Later, the caretakers tried to get her to perform for the camera and she turned sulky and uncooperative. You could feel her spirit across the miles. It was just a few months later when we got the call. I remember the incredible joy of booking tickets and packing bags. We were FINALLY going to get our daughter. The town Natalia lived in was dreary, even in bright sunlight. There was a dark haze of dirt on everything as we drove to the babyhouse. Behind imposing black iron gates lay the creamy white brick babyhouse. I was amazed at how clean it was inside. There were nurses and caregivers bustling about everywhere. We were escorted to a large room to meet our daughter. She was heard before she was seen. She howled all the way up the stairs and down the hall. She screamed when she met us. She was terrified, so was I. It appeared we had waited all this time for a child who hated us. In Kazakhstan the law states that you must visit the child for two weeks prior to the court date. The time is to help your child bond with you. I was so glad that she had the time to bond before we took her home. After three days she would take food from us like a woodland creature. She would grab whatever was in our hands and run away. After five days she allowed us to touch her. After eight days she would sit with us, and after twelve days she preferred us. She lived all of her life in the babyhouse and had no knowledge of the world outside. She was afraid of bathtubs, cats, cars, stores, just about everything. But, she trusted us. We were her mommy and daddy. When the judge ruled that Natalia was our daughter I cried as I had in the delivery room. She was ours, truly and finally. Later in the day we picked up our daughter, dressed her in her new clothes and said tearful good-byes. We are so very grateful to the people who loved her and took care of her until we found her. Our little girl waved good-bye, took our hands and walked through those heavy black iron gates and never looked back. Today, she is a giggling little sister to two adoring big brothers. She has many friends, loves to help mommy in the kitchen, and races her bike along the street. She IS our little girl and always has been, we just took a roundabout route to find her. 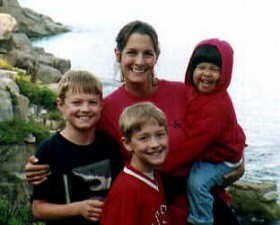 We think of Sunita, our Indian daughter, often and will never forget her. We may never be sure why God sent her into our lives, but I will always feel that she pointed the way to Natalia. And, she taught me that you cannot “save” anyone. You just have to follow God’s lead. Today I am an adoption coordinator for World Partners Adoption and am trying to learn to follow instead of try to lead.